SNES Super Ghouls 'n Ghosts (USA) in 17:03.0 by Ferret Warlord. Arthur's fiancée is once again kidnapped by demons soon before their marriage. Once more Sir Arthur must brave the forces of the underworld in his skivvies. Watch as Ferret Warlord runs through this infamously hard game in record time! Normally, to fight the final boss of the game, you must play through the game twice. To make the movie less repetitive, Ferret Warlord uses a code to start at the final bosses of the first playthrough. 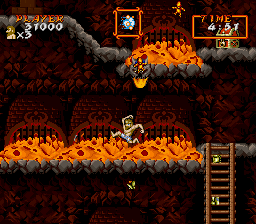 Furthermore, the player must have a special weapon in order to fight the final boss, and this weapon can only be found when the player has fully upgraded armor. Ferret Warlord obtains this weapon at the end of the first autoscrolling level.